Aziz Ansari has quickly established his presence in the comedy world. He was one of the leading actors in the immensely popular NBC series 'Parks and Recreation', is developing a number of films and released his second hour-long standup special, 'Dangerously Delicious' in 2012. 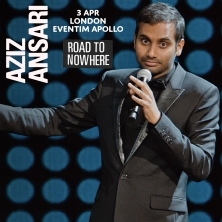 Eventim is the place to look for Aziz Ansari tickets and tour dates. To be the first to hear when more Aziz Ansari tickets go on sale you can sign up to the Eventim Ticket Alarm below. Aziz Ansari has quickly established his presence in the comedy world. He starred in one of the most popular television series of recent years, 'Parks and Recreation', is developing a number of films and released his second hour-long standup special, 'Dangerously Delicious' in 2012. Ansari stars in the Emmy nominated NBC series, 'Parks and Recreation'. Ansari is also keeping busy in the film world. He voiced a character in the Twentieth Century Fox animated film 'Epic', and was seen in 'This is the End' opposite Seth Rogen, Jonah Hill, and James Franco. Additionally, he appeared in Universal’s 'Funny People'. Ansari also appears in 'Get Him to the Greek' alongside Russell Brand, Jonah Hill and Sean ‘Diddy’ Combs. He’s also had roles in the hit comedies 'I Love You, Man', 'Observe and Report', and voiced a character in the Twentieth Century Fox animated film 'Ice Age: Continental Drift'. Ansari has also become a regular on the late night circuit with memorable appearances on 'The Late Show with David Letterman' and 'Jimmy Kimmel Live'.